For an office recycling scheme to work efficiency in the long term, a relationship with a reputable recycling collection service will need to be established. To meet the demand of an increasingly environmentally conscious nation, there are now a large number of dedicated commercial recycling collection services across the UK. These companies can vary in terms of whether they will collect your recycling waste from your office premises or a designated collection point. They will also specify the type of materials they will accept and sometimes even its quality and condition. To make the process of finding a suitable collection service for your company easier, the WRAP organisation – which is dedicated to helping individuals and organisations reduce waste and recycle more – offers a useful search facility on its website. The facility enables you to search for a service by UK region and by the types of materials you need recycled, such as tin, paper and plastic. You can also search for services in local authority areas by using the advanced search engine on the Business Recycling Directory website. Although most of the UK is covered in one way or another, there are inevitably areas that do not offer an appropriate service whether it’s due to lack of demand or a remote location. Are they able to deal with all the recyclable materials that you produce? This is particularly important if you have waste more unusual than the standard office supplies and materials like paper, plastic and tin. Do they have appropriate authorisation and licenses to collect and transfer the recyclable materials? Will the materials be collected on a specific regular date or on request? 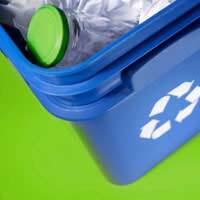 How should the recyclables be prepared and sorted ready for collection? Does the service provide site collection containers and promotional notices etc? Do they provide a document destruction facility for confidential waste? Another pertinent question to ask the company concerns what costs are involved. Most recycling services are private enterprises and need to charge for their collection scheme in order to cover their own costs, such as staff, transportation and administration. Although paying to have your waste collected may add to your outgoing costs in the short term, these will ultimately be offset by the overall savings of the recycling programme. Additionally, with the costs of sending waste to landfills rising fast, the more waste that is recycled, the lower the costs spent on landfill dumping. It’s unlikely to ever be cost-efficient for a small organisation, which only generates small amounts of recyclable waste, to pay for the services of a recycling collection company, so how do they manage? This corner of the market has been filled by a number of recycling organisations that specialise in offering flexible collection options to meet the needs of smaller business concerns. These services can be found in the online Business Recycling Directory.